Appoint, Review, Promote and More! Streamline initial appointments, performance, retention and tenure events for all of your faculty – salaried, adjunct and volunteer alike. 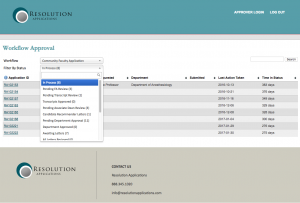 Each workflow allows you to collect different documents and display different forms. Think outside the box and utilize this powerful workflow engine for other processes for amazing results. Have different colleges with different procedures within the same university? Need to appoint unpaid faculty outside of a normal HR hiring process? Need to have your faculty annually attest to certain information and track compliance each year? Easy Peasy. Workflow Tracking automates any faculty workflow process. Turn any process into an automated workflow. Configure each workflow to collect applicable documents and data to flow through unique paths for each type of faculty. Secure and Confidential. Configure each workflow so that individuals, committee members and even external reviewers have access to only what you want them to see and when you want them to see it. Customize forms to collect the data that you need to report on later. Create a dossier of documents needed for promotion, retention and tenure events, and nearly anything else you can think of. Customize email notifications to be sent at each step of the way. Need to solicit confidential letters? Just say the word and our tools will notify external individuals a secure link when it’s their turn to upload their recommendation where they’ll see exactly what you want them to see about the candidate and nothing more. WorkflowTracking Sample. Click for Larger View.